We’ve been writing about the coming trade wars for years and were among the first to spot the launch of a real trade war in early 2018. When President Trump announced tariffs on solar panels, washing machines and aluminum imports last January, most analysts shrugged and said it was just for show or it was just posturing for the base. This la-di-da attitude from Wall Street analysts continued through the spring and summer as tariffs escalated to include steel, electronics, textiles and hundreds of billions of dollars of other imported goods mostly from China. We continued to warn that the trade war was serious and would escalate and last for a prolonged period of time, perhaps 10 years or longer. Now, finally, Wall Street has gotten the message. As this article shows, JP Morgan now predicts a “full-blown trade war” with China and has started to downgrade Chinese stocks. It’s nice to have company, but the Chinese stock market has been crashing for months, so the time to reap gains was when we first sounded the alarm last winter. That’s OK. The trade war has years to run and opportunities for trading profits in Chinese stocks, the yuan and Chinese credit are plentiful. The key is to conduct the analysis with your eyes wide open and not be misled by a phony narrative about China as the economic giant of the 21st century. 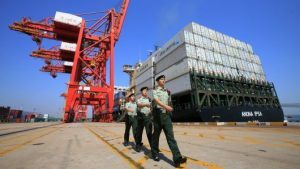 In fact, the Chinese economy is quite large, but it’s also quite vulnerable and those vulnerabilities will be more and more on display as this trade war drags on.